It’s time once again to share some of my kids’ art and craft projects in school or something that they just like to do at home. The first one is a Popsicle stick pencil holder made by Kristel as a gift for her class adviser last Teacher’s Day. This is quite simple and easy to make. Uses recyclable materials too. She first got a clean, empty can of a juice drink. Then, using the glue gun and glue stick, she glued popsicle sticks all around the body of the can. Then, she found small different colored plastic shapes which she glued to the top and bottom rim of the can. Lastly, she tied a red ribbon in the middle of the can. The second project is a mask made of paper mache by Emmuel. We bought a Jabbawockeez mask as pattern for the paper mache at the Pasig Palengke and it costs P45. It’s just a plain white mask made of carton. To start the paper mache, my son mixed some water with glue (about 1:3 ratio). Then he tore strips of newspaper (about 3/4 inch wide). Paper mache guides say that it’s better to tear the newspaper instead of cutting with scissors. Using a brush, put the glue mixture on the newspaper strips and then stick them smoothly to the jabbawockeez mask. Make sure that the glued strips overlap. When the whole mask is covered with newspaper, let dry before gluing another layer of newspaper. Do 3 layers of newspaper then repeat the same step but use tissue paper instead. Make 2 layers if you’re using one-ply tissue paper and once if you’re using two-ply tissue paper. Let dry and then you can start painting the mask with whatever design you want. Afterward, you can peel off the paper mache from the Jabbawockeez mask pattern. Here’s the finished product of my son. The fourth project is simple paper mat weaving with design by Kristel. Here, she just used black paper, with 12 inches wide of strips cut vertically but leaving 1-2 inches of uncut paper on top. Using another piece of colored paper, she cut strips of the same size as the black paper and wove it through the black strips. When done, she used glitter glue to print the quote “Everyone deserves respect.” Her teacher loved this piece of artwork (and of course the quote) and she asked for a copy and displayed it in their classroom. Paper mat with quote "Everyone deserves respect." So, that’s it for this post. Until next time. Happy crafting. These crafts bring back so many fond memories of my elementary days! :) I enjoyed doing the myriad art projects we had then and I considered each a masterpiece. I would even stay late at night without the knowing of my mom while meticulously finishing it. I do that, too, Farida – stay up late just to finish my art projects. But there were times that my kind dad also stay up late just to help me. Haha. That’s so cute and kulit! It’s good to let children practice arts and crafts while they are still young to develop their aesthetic skills. Cute! I remember doing something similar when I was younger. It’s great that you get to do crafts with your kids. Nice way to bond. Interesting craft ideas you have here! I like to try the masks so my kids could play pretend. 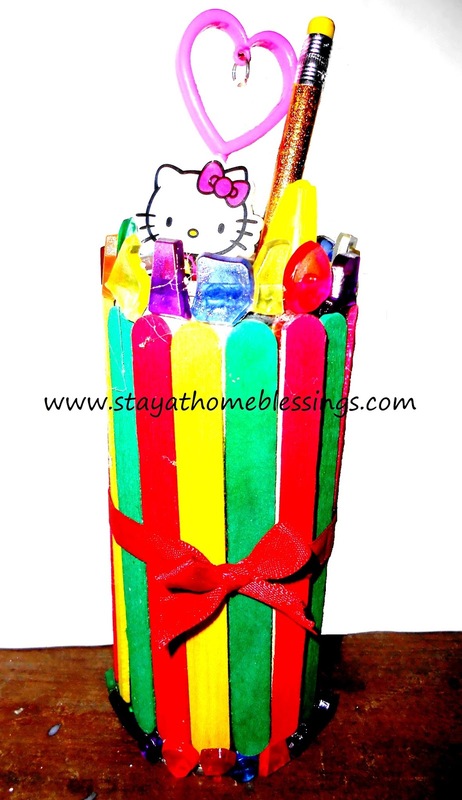 The first project is indeed cute and can be used by kids at home to organize their things like crayons and pencils. These are nice I plan to do more crafts with my son over the summer to keep him busy. I think we could experiment a lot with paper mache and paint. paper mache is indeed a good art project and it makes use of old newspaper which helps recycle it to other beautiful creations. Those are really cute mask that the kids made. I remember doing that with the boys when they were younger. Nice projects! My daughters made similar masks for school a couple of years ago and also just last month. They really enjoyed it because they love arts and crafts. This is what I am looking for. I have been thinking what arts and crafts activity I can do with my son. I notice he likes to draw so I am encouraging him to love arts and crafts more. Thank you for sharing. Those are wonderful crafts for kids.. I’m looking forward for my kids doing these crafts in the future. Everything is very nice. Great job! I remember when we attended the Mom and Me Fun Circuit event, one of the activities was to make an animal mask. My son, and all the other kids had so much fun! Those arts are stunning and very creative I love the Popsicle stick pencil holder.